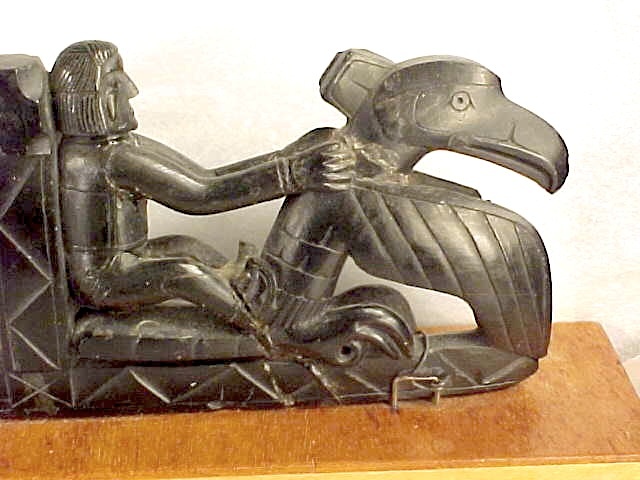 It seems most likely to be Haida, of course, argillite, of course, a typical panel pipe, and most likely between 1850 and 1900 or so I would imagine, like this one which dates from the Pig War. My understanding is most of these were made for the tourist trade and that they don’t necessarily illustrate mythological or historical events, but any light on what might be represented would be welcome. As you can see, the condition is not that good – it looks like at some point it was broken clean into three pieces. 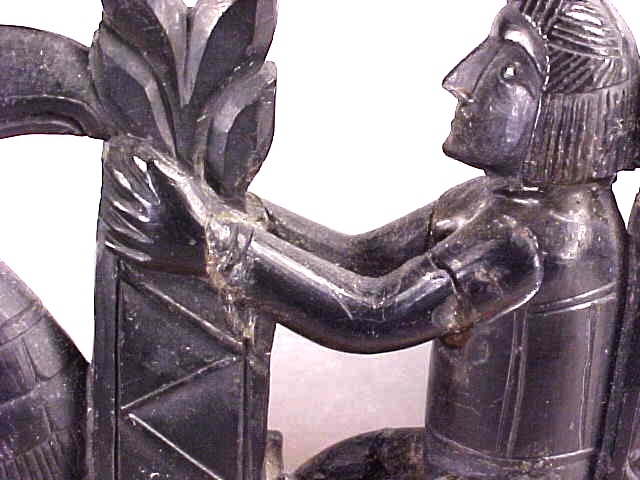 Nonetheless, some skillful conservation could salvage an extremely attractive piece even starting in this condition. I’m not sure if there are design cues to look for to indicate older vs newer ones of these, or stylistic cues indicative of specific artists. To my eye, the quality looks to be about average for this genre – certainly less skillfully made than this one I discussed before. 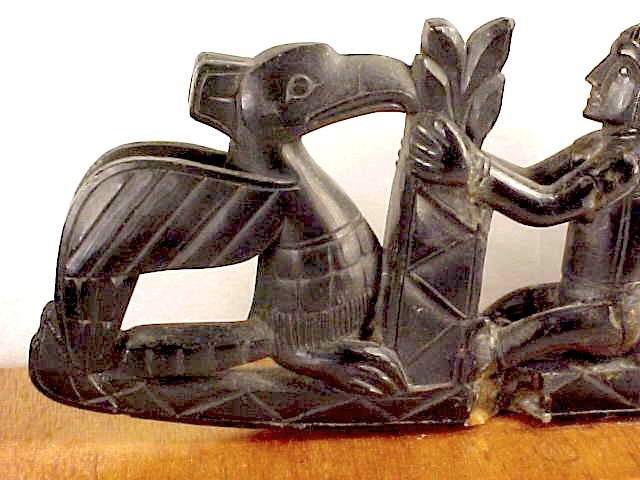 Anyway, not to be all Antiques Road Show on you, but if you know much about these or have insight into this one, its origin, age, conservation needs, or means of eventual disposition then why not leave me a comment? The executor will be reading and perhaps able to answer questions which might arise. It’s not really my business, but it was a very polite email, and a very cool panel pipe. Incidentally, if you do leave a comment, then the email you use is hidden from view and there is no need to use your real name if you prefer not to. 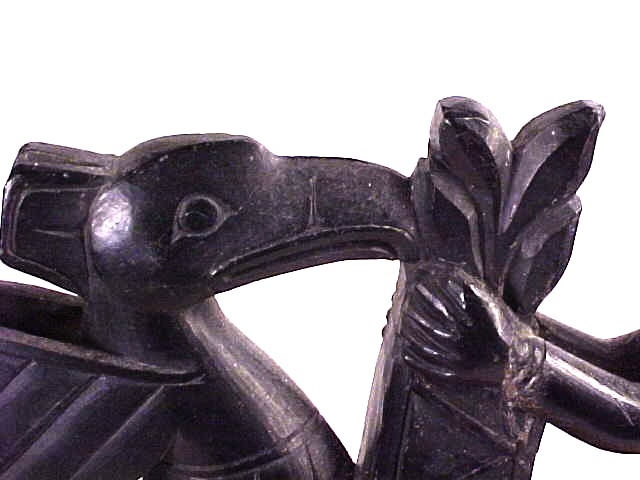 This entry was posted in First Nations, Haida Gwaii, Miscellaneous and tagged argillite, art, Haida, Haida Art, pipes. Bookmark the permalink. This is a nice thing, even in its damaged condition. I wonder what the structure in the middle is, and teh post that one man is gripping. I hope someone with knowledge of these things will weigh in with some ideas. To my eye those are tobacco leaves and the theme is of riding on a boat or ship. The structure in the middle….not sure – perhaps relates to the below deck of ship, and the cross is referring to… Christianity? The triangle patterning seems hasty, and indicative of tourist trade item. APM — that’s a great link, thanks. 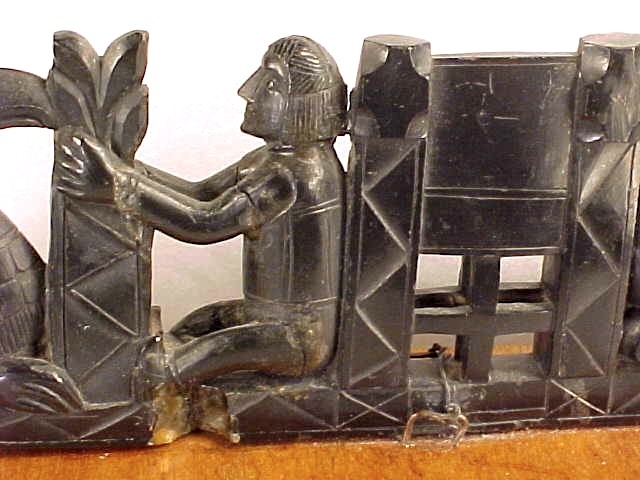 Who knew argillite was such a living sort of substance. Well, I imagine lots of people did. Karen – thanks. I also wondered if the cross might not be like the window of the Captains cabin on the transom of a ship. Tobacco leaves is a good idea. The principle reference would be this one, which I don’t have a copy of. Macnair, P.L., and A.L. Hoover. Special Publication No. 7, British Columbia Provincial Museum. Victoria, BC: Ministry of Provincial Secretary of Government Services, 1984. 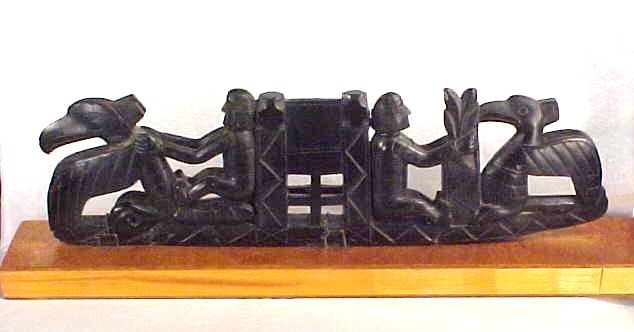 Update: over the summer, I got an email from the owner who indicated the family had contacted a Canadian museum on the Northwest Coast and were interested in donating this pipe to them. I don’t think that’s definite yet but would be a nice outcome for a piece which has value for its workmanship and subject matter if not exactly for display purposes. I imagine both scholars and carvers could find it an interesting addition to a study collection. Edit: confirmed this morning the pipe has been donated to the RBCM.